Handcent SMS is one of those apps that has been around since the beginning and is still going strong. Today they have just updated to version 3.9.5 in the Android Market and are bringing some cool new features with it. Improve Mms+ feature, now you can more easy to attach and download high resolution picture and full quality video from handcent Mms+ network. New Default Messaging application option can full replace stock messaging app and work independently. 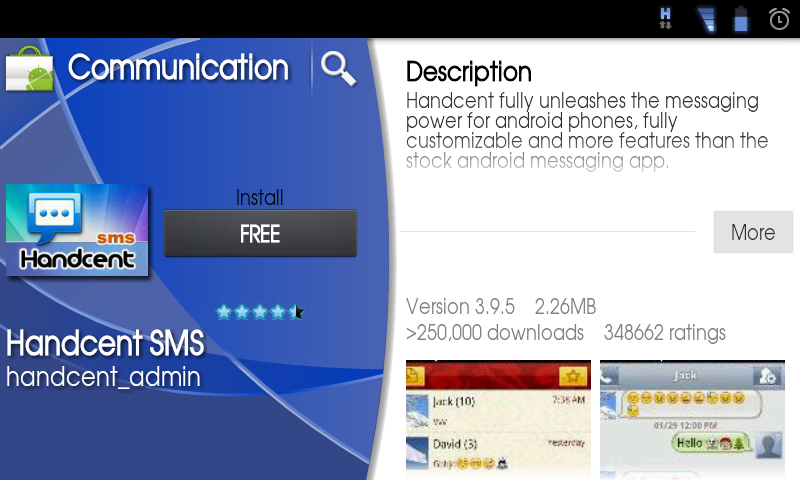 Full work (SMS & MMS) with Korean SKT version of Galaxy S and SGS2. Support Led color for Sidekick4g. New Delay send option, you can cancel after click send. Does anyone here use Handcent? I’ve given it a few tries but always end up going back to stock, especially since CM7 gives me all the customization I could ever want for text messaging. Motorola Will Unlock the Atrix 4G Bootloader When it Receives Gingerbread? We'll See.